This article is about the vehicle. For railway usage, see railroad car. For hand-pulled wagons, see toy wagon. For alternative uses of "wain", see Wain (disambiguation). For other uses, see Wagon (disambiguation). A hay wagon in Germany, of a type common throughout Europe (the leiterwagen). The sides are actually ladders attached to serve as containment of hay or grain, and may be removed, such as for hauling timber. A wagon (also alternatively and archaically spelt waggon in British and Commonwealth English) is a heavy four-wheeled vehicle pulled by draught animals or on occasion by humans (see below), used for transporting goods, commodities, agricultural materials, supplies and sometimes people. Wagons are immediately distinguished from carts (which have two wheels) and from lighter four-wheeled vehicles primarily for carrying people, such as carriages. Wagons are usually pulled by animals such as horses, mules or oxen. They may be pulled by one animal or by several, often in pairs or teams. However, there are examples of human-propelled wagons, such as mining corfs. A wagon was formerly called a wain and one who builds or repairs wagons is a wainwright. More specifically, a wain is a type of horse- or oxen-drawn, load-carrying vehicle, used for agricultural purposes rather than transporting people. A wagon or cart, usually four-wheeled; for example, a haywain, normally has four wheels, but the term has now acquired slightly poetical connotations, so is not always used with technical correctness. However, a two-wheeled "haywain" would be a hay cart, as opposed to a carriage. Wain is also an archaic term for a chariot. Wain can also be a verb, to carry or deliver, and has other meanings. A person who drives wagons is called a "wagoner", a "teamster", a "bullocky", a "muleskinner", or simply a "driver". The exact name and terminology used is often dependent on the design or shape of the wagon. If low and sideless may be called a dray, trolley or float. When traveling over long distances and periods, wagons may be covered with cloth to protect their contents from the elements; these are "covered wagons". If it has a permanent top enclosing it, it may be called a "van". Turning radius was a longstanding problem with wagons, dictated by the distance between the front wheels and the bed of the wagon—namely, the point where the rotating wheels collide with the side of the wagon when turning. Many earlier designs required a very large turning radius; however, shrinking the width of the bed means decreasing the size of the load. As this is a problem that carts (by virtue of their two-wheeled nature) do not face, this factor, combined with their lighter weight, meant that carts were long preferred over wagons for many uses. The general solutions to this problem involved several modifications to the front-axle assembly. The front axle assembly of a wagon consists of an axle, a pair of wheels and a round plate with a pin in its centre that sits halfway between the wheels. A round plate with a hole in its centre is located on the underside of the wagon. The plate on the wagon, in turn, sits on the plate on the axle between the wheels. This arrangement allows the axle and wheels to turn horizontally. The pin and hole arrangement could be reversed. The horse harness is attached to this assembly. To enable the wagon to turn in as little space as possible, the front pair of wheels are often made smaller than the rear pair to allow them to turn close under the vehicle sides, and to allow them to turn still further, the wagon body may be waisted. This technique eventually led to further designs well-adapted to narrow areas; the front wheels of express wagons, trolleys and floats are small enough to turn under the vehicle's body. Wagons have served numerous purposes, with numerous corresponding designs. As with motorized vehicles, some are designed to serve as many functions as possible, while others are highly specialized. This section will discuss a broad overview of the general classes of wagons; for details on specific types of wagons, see the individual links. Farm wagons are built for general multi-purpose usage in an agricultural or rural setting. These include gathering hay, crops and wood, and delivering them to the farmstead or market. 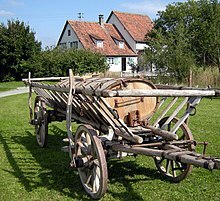 A common form found throughout Europe is the leiterwagen ("ladder wagon"), a large wagon where the sides often consist of ladders strapped in place to hold in hay or grain, though these could be removed to serve other needs. A common type of farm wagon particular to North America is the buckboard. Freight wagons are wagons used for the overland hauling of freight and bulk commodities. In the United States and Canada, the Conestoga wagon was a predominant form of wagon used for hauling freight in the late 18th and 19th centuries, often used for hauling goods on the Great Wagon Road in the Appalachian Valley and across the Appalachian Mountains. Even larger freight wagons existed. For instance, the "twenty-mule team" wagons, used for hauling borax from Death Valley, could haul 36 short tons (33 t) per pair. The wagons’ bodies were 16 feet (4.9 m) long and 6 feet (1.8 m) deep; the rear wheels were 7 feet (2.1 m) in diameter. A delivery wagon is a wagon used to deliver merchandise such as milk, bread, or produce to houses or markets, as well as to commercial customers, often in urban settings. The concept of express wagons and of paneled delivery vans developed in the 19th century. By the end of the 19th century, delivery wagons were often finely painted, lettered and varnished, so as to serve as advertisement for the particular business through the quality of the wagon. Special forms of delivery wagon include an ice wagon and a milk wagon. Some wagons are intended to serve as mobile residences or workshops. These include the Vardo, a traditional wagon of the 19th-century British Romani people. The steam wagon, a self-powered development of the horse-drawn wagon, was a surprisingly late innovation, entering service only in the late nineteenth century. In the city center of Schwäbisch Gmünd, Germany, since 1992 the city's plants are irrigated using a horse-drawn wagon with a water tank. In migration and military settings, wagons were often found in large groups called wagon trains. In warfare, large groups of supply wagons were used to support traveling armies with food and munitions, forming "baggage trains". During the American Civil War, these wagon trains would often be accompanied by the wagons of private merchants, known as sutlers, who sold goods to soldiers, as well as the wagons of photographers and news reporters. Special purpose-built support wagons existed for blacksmithing, telegraphy and even observation ballooning. In migration settings, such as the emigrant trails of the American West and the Great Trek of South Africa, wagons would travel together for support, navigation and protection. A group of wagons may be used to create an improvised fort called a laager, made by circling them to form an enclosure. In these settings, a chuckwagon is a small wagon used for providing food and cooking, essentially a portable kitchen. Wikimedia Commons has media related to Wagons in art. As a common, important element in history and life, wagons have been the subjects of artwork. Some examples are the paintings The Hay Wain, The Haywain Triptych and on the Oregon Trail Memorial half dollar. During a transition to mechanized vehicles from animal powered, the term wagon was sometimes used such as with the Duryea Motor Wagon. In modern times the term Station wagon survives as a type of automobile. ^ Oxford English Dictionary, 2nd ed. Wain n. 1. ^ "Wagoner". Merriam-Webster. Retrieved 29 January 2017. ^ "Wagoner". The Free Dictionary. Retrieved 29 January 2017. ^ a b c d e f "WAGGON". Rees's Cyclopædia. 37. London: Longman, Hurst, Rees, Orme & Brown. 1817–1818. Rines, George Edwin, ed. (1920). "Wagon" . Encyclopedia Americana. ^ Gardner, Mark L. (September 1997). "Wagons on the Santa Fe Trail: 1822-1880" (PDF). National Park Service. Retrieved 5 February 2013. ^ a b "Twenty Mule Teams". Death Valley National Park. National Park Service. Retrieved 6 February 2013. ^ Stratton, Ezra M. (1878). The World on Wheels. New York: the author. pp. 442–444. ^ Hillick, M.C. (1898). Practical Carriage and Wagon Painting. Chicago: Press of the Western Painter. pp. 2, 109–116. ^ Sanders, Walter R. (1922). Ice Delivery. Chicago: Nickerson & Collins Co. pp. 170–172. ^ O'Sullivan, Timothy. "Bealton, VA". Library of Congress Prints & Photographs. Retrieved 5 February 2013. ^ "Thaddeus Lowe with his Inflation Wagons". Smithsonian Institution: National Air and Space Museum. Retrieved 5 February 2013. Look up Wagon in Wiktionary, the free dictionary. Wikimedia Commons has media related to Wagon. Chisholm, Hugh, ed. (1911). "Wagon" . Encyclopædia Britannica (11th ed.). Cambridge University Press.